In today’s manufacturing environment of continuous improvement, the analysis of production or process data is an ongoing effort. The ability to drive improvements into the process, based on actual real-time information is essential. Being able to incorporate an industrial PC with its powerful analysis and communication applications (i.e. Excel, Word, Access, Outlook etc.) directly into the control and data ﬂow is a primary advantage. When the engineer couples a cMT-iPC10/15 with a cMT-SVR he/she can run EasyBuilder Pro software to work directly, via fully functional HMI with the plant ﬂoor devices and then channel the resultant data ﬂows immediately into the appropriate analysis applications. The resulting analysis can be shared in real time with colleagues within the plant or around the world, increasing productivity, quality and reliability, driving down costs and travel expenses, and saving time. The cMT-iPC10 and the cMT-iPC15 both include a 1.75GHz dual core 64bit CPU, 32GB sad and 4GB ram. The cMT-iPC10 boasts a 9.7 TFT display with 1024x768 resolution. The cMT-iPC15 has a similar 15-inch-High Resolution display. Based on either Windows 7 or Windows 8.1, cMT-iPC10 and cMT-iPC15 not only support 3rd party software but can also be used as an HMI through connection to cMT-SVR by using built-in cMT-viewer. By selecting Monitor Mode in cMT Viewer, up to 50 screens can be monitored simultaneously. 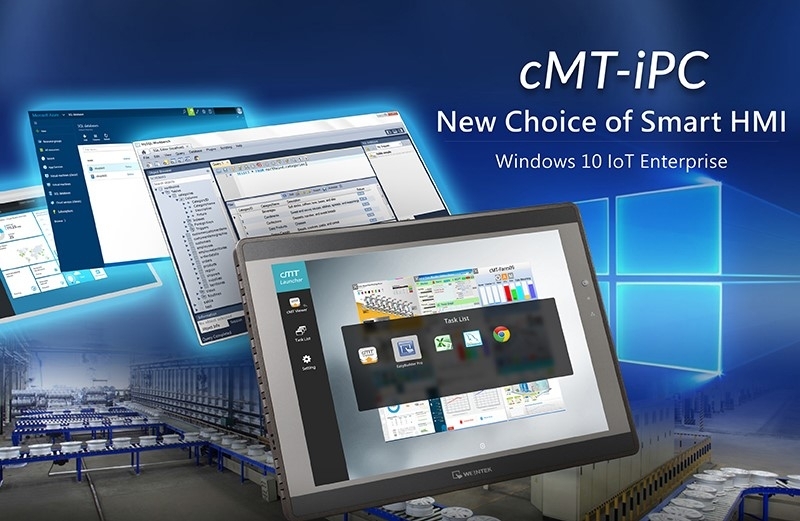 In addition to Windows 7 OS, now Windows 10 IoT Enterprise (LTSB) can be another option for cMT-iPC10 and cMT-iPC15. As a member of Windows 10 series, Windows 10 IoT Enterprise (LTSB) aims to integrate a variety of smart devices, from small industrial gateway to big and complicated devices, such as Point-of-Sale terminal machines, automated teller machines (ATM), and so on. Combining with the up to date Microsoft developer tools and Microsoft Azure, Windows 10 IoT Enterprise (LTSB) allows users to collect, save and manage data, and to deploy IoT applications inside the factory with lower costs. In addition to the above advantages, Windows 10 IoT Enterprise (LTSB) can run Universal Windows APPS and traditional Windows APPS, and the security is fully upgraded.